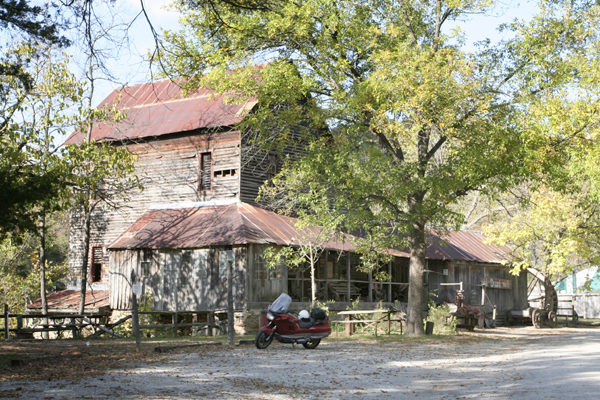 Missouri's Water Mills ... Get glimpse into the life of early Ozark residents, and enjoy great riding for today's motorcyclists visiting the area. 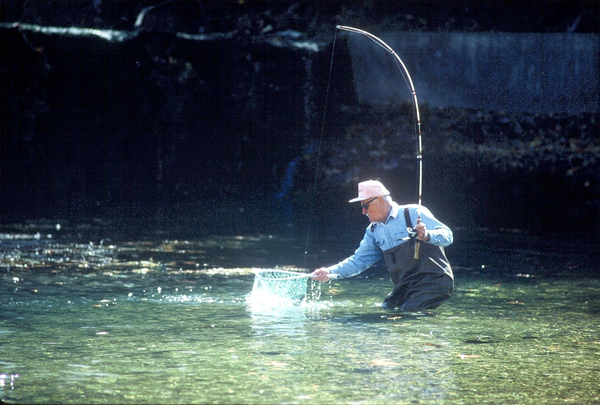 Over countless eons, water has shaped the contour of the Ozarks, which makes for great riding. Looking back at the days before paved roads were common and the primary mode of transportation was a good horse and wagon, water mills played a vital role in the lives of Ozarks hill folk. As the name implies, they were places where wheat and corn were ground into the staples of everyday life. But they often had general stores and post offices associated with them, and so were places where the latest news and gossip could be shared between friends and neighbors. The classic, beautiful Hodgson Mill is set against an equally beautiful mountain side. A spring bubbling up from underneath the building turns the waterwheel in a unique way to power a water mill. Though Hodgson Mill no longer grinds grain, grocery stores across the country sell flour and meal with its picture and name emblazoned across the bag. In its hay day the mill also had a general store and post office. As evidenced by the topography of the Ozarks, water has shaped the the land. Bridges cross lakes, rivers and streams everywhere in the Ozarks. 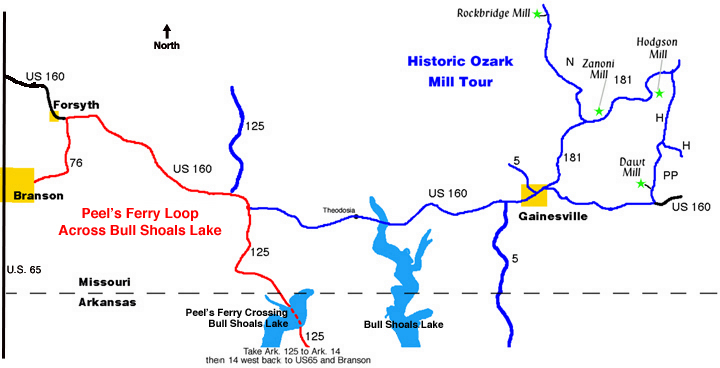 Whenever I visit the water mills in Ozark County, Missouri, I love to take the Peel Ferry, the last remaining ferry crossing Bull Shoals Lake. Ferries used to be an important method of crossing bodies of water in the Ozarks. 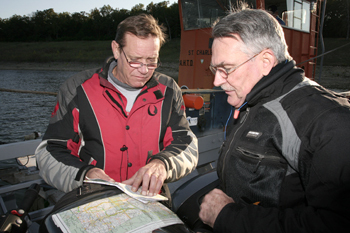 The Peel Ferry, on Ark. 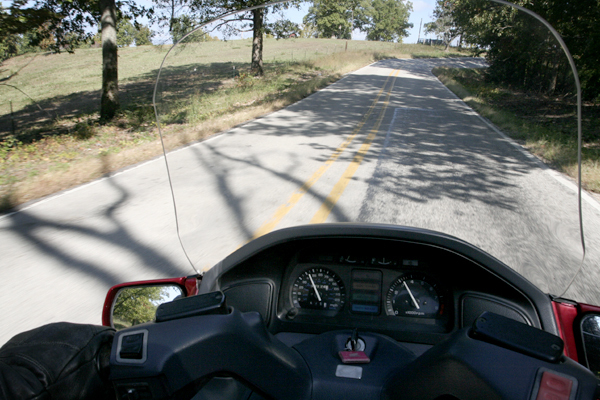 125, provides a nice respite on a long ride. 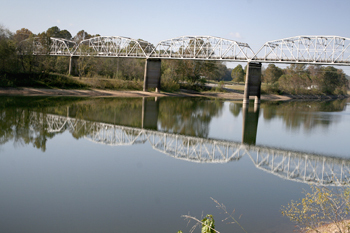 The bridge shown here crosses Bull Shoals Lake at Forsythe, Missouri, near Branson. On the Peel Ferry, this group of BMW riders from Texas planned the next leg of their trip as they made the leisurely ferry crossing. 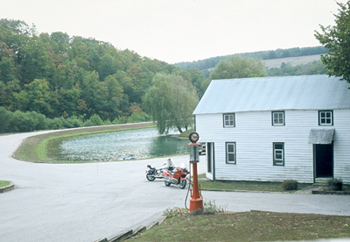 The mill at Zanoni is part of a private residence, but the owners don't mind visitors riding up the the beautiful circular drive for a close up look at the mill and original store. The granddaddy of all the mills is the Old Dawt Mill, stand as proud sentinels of days-gone-by in the Ozarks. The Dawt Mill is still a working mill and destination for thousands of visitors a year who want so see a working mill. 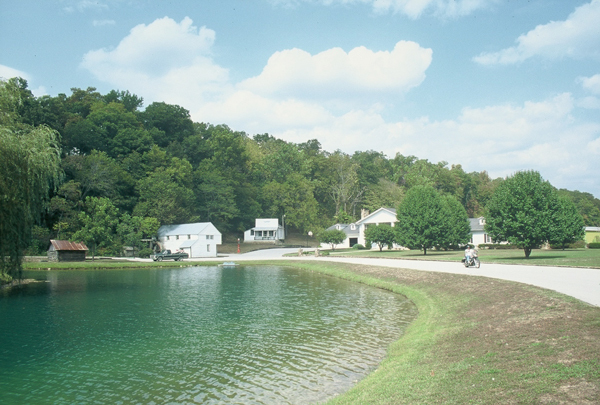 It has cabins, camp sites, a store and restaurant. 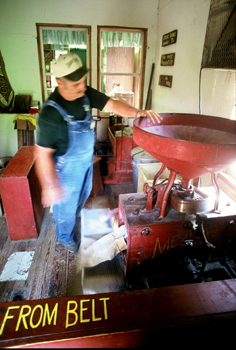 Dawt Mill also features tours of its museum and daily demonstrations of milling. 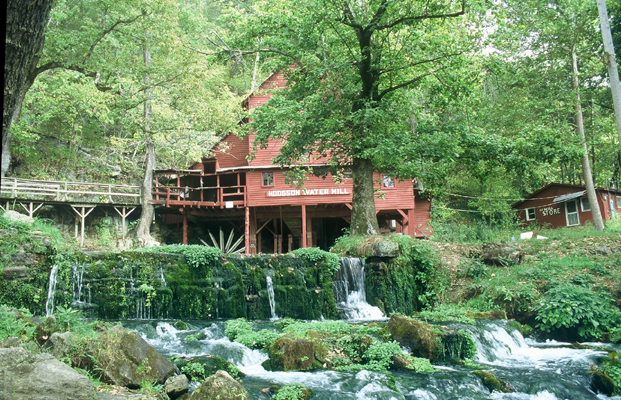 The Rockbridge Mill is no longer a working mill, but has excellent tout fishing in its cold, spring-fed mill pond, and a very nice fine restaurant which draws diners from a wide area across the Ozarks. My personal favorite route to the water mills of Ozark County takes me from my home in Berryville northeast to the intersection of US 65 and Ark. 14 at Omaha. I take Ark. 14 east to Ark. 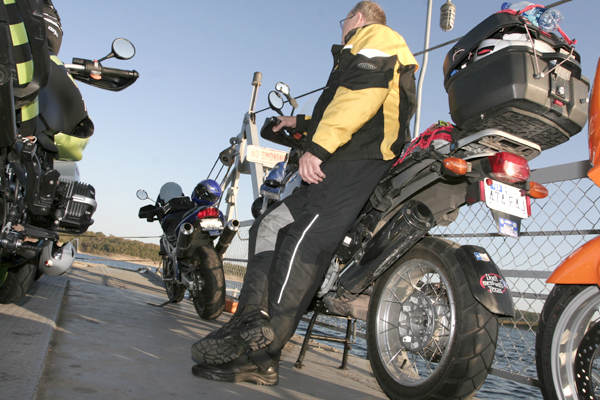 125 and head north to cross Bull Shoals Lake on the Peel Ferry. Once across the ferry, I continue north on Ark. 125, which becomes Mo. 125 and intersects US 160. 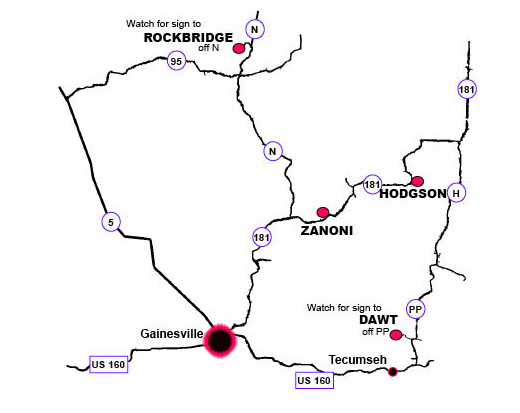 At US 160, I ride east to Gainesville, Mo. From Gainesville, the four mills mentioned here are easy to find. From Gainesville, I usually take US 160 to Mo. 76 back to Branson. From Branson, it's an easy, short ride for me back to Berryville, or for you back to wherever you are staying. Enjoy your ride! Click HERE for a wide area map of south centeral Missouri and the mill area. Click HERE for a more detailed map.